It makes me smile just to think of it! Chris and I were sitting on the sofa when our then 3 year-old came down the stairs after bedtime-like this! 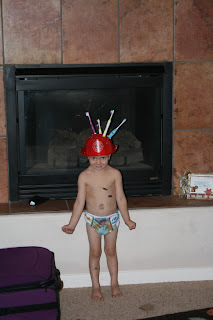 Undies on backwards, tatos everywhere and his fireman hat with toothbrushes suctioned to it! OMG! We were ineffective as parents, because after we quit laughing-we took pictures! What can you do?! After we'd finally settled down and returned him to bed my husband looked over at me and said, "I didn't see that coming!" Oh-Hollan, they say each of our kids get funnier and funnier-so this last one should be a riot, right?! I am so grateful for the joy my sweet children bring to my life. We were happy previously, but adding these children in brought us happiness neither of us could have imagined! This 1st one is my favorite of all of those taken. This swimsuit shows just how pregnant I am! 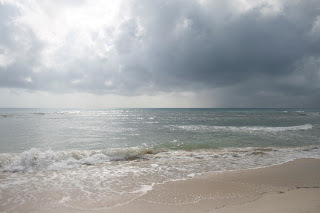 Even on a cloudy day the ocean was BEAUTIFUL! 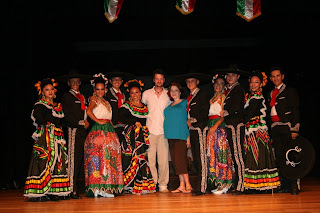 We were able to take our picture with the Mexican dancers after their show! It was a stunning vacation. We had a private pool, unlimited drinks and 5 star restaurant food. The opportunity was amazing and I'm thankful to have had the expeience-and a stamp on my passport! 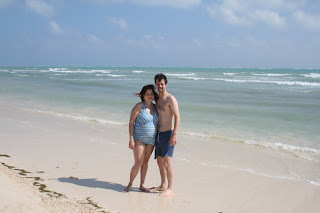 Chris and I JUST returned from a luxury vacation on the Mexican Riveria at the Secret SilverSands Resort in Cancun! It was a whirlwind and we were treated like royalty there. As amazing as it was to be served NAB Pina Coladas on the beach, I was grateful to land safely back on US soil and return to see my children! Our reality is amazing as well and I find myself feeling more thankful. I'm trying to adapt an 'attitude of gratitude' as we have so very many blessings. I wasn't physically feeling well today, so we skipped church, but I am still humbled by the inspiring friends and church family we've found at Destiny Center. Our pastor is amazing, the kids have 2 special grandmas, and we have many who care and think about us. My new friend and customer Charlene had placed a CTMH order I delivered, and it was nice to chat with her for awhile and feel I have something to offer her and her business! Oh-and an update on the craft show from my previous post.... I sold a few hand-made things and even better, found a few people who would like to learn as well. The best part?! The director of the Rio Rancho Parks and Recreation Dept. stopped by my booth and asked if I would teach for them!! I finished class descriptions for 4 classes to be offered in the upcoming Spring catalog, where I will be able to extend services and the papercrafting community with thousands of local people! I'm even offering 2 special classes for children and seniors! YAY! I'll try to get into Abq. tomorrow and work on my photos to share. I'm caught up on e-mails, but haven't begun christmas cards yet. I have another ultrasound on Tuesday morning-10 more weeks til our new baby boy will be here! WOW! I hope you are well and finding yourself in the Christmas spirit. Remember to stop and be grateful today. ~With blessing, B.